It’s been a while since we last reviewed a new homebrew release for a retro console, and when we saw Hermes for the Dreamcast, we couldn’t resist trying our hands at this wacky looking title. While this release works on the Dreamcast, it also works on many different platforms, like PSP, PC and so on, thus the developers did not limit themselves to one platform. That being said, a game revolving around a chef, chasing a chicken, while constantly fighting the urge to poo sounded very amusing to us. The story of Hermes is quite simple, as it revolves around a chef who was craving some good old fashioned chicken dish, but the chicken he was about to butcher escaped from his clutches, forcing Hermes to chase him. Soon after he finds himself in strange lands, with donuts and strange beverages floating in the air, and a whole lot of monsters in the way of his objective. Overall you don’t really get any story value in the game, but if you buy the Dreamcast version, you’ll get a small comic book as a bonus, which neatly tells you the story of the game. 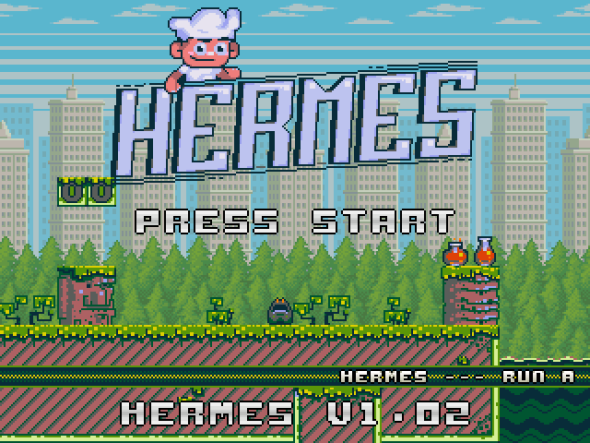 Graphically Hermes doesn’t really stress the capabilities of the Dreamcast, and is like many homebrew titles on the platform, an 8 bit quirky platformer. Of course this doesn’t mean the game doesn’t look good, as it’s very likeable in the style it’s aiming for. You’ll be treated to a small, but adorable chef, a Zelda-like chicken, many weird enemies, flying donuts, odd drinks and last but not least occasional wooden outhouses for when emergency strikes the poor old chef. Other than that, the graphical prowess is a bit on the simplistic side, but it’s appealing nonetheless, especially for fans of good old fashioned platformers. Catchy and upbeat are the two words that properly describe the soundtrack of Hermes. All of the music is also rather retro inspired, as it’s more chiptune than actual instrumental tunes. The latter perfectly suits the pixilated graphics, and accompanies the simplistic sound effects in a proper fashion. While the soundtrack isn’t extremely diverse, it will not get on your nerves during your playthrough. Hermes is a fairly old school platformer with an interesting twist. While your goal is to reach the end of the level, hopefully catching the escapee chicken, you’ll also have to take into account your hunger meter, as when it’s empty it’s game over. It will rapidly decrease no matter what you do, but getting hit by enemies will decrease it even further. This is an interesting take on HP for a game such as this. Of course you can replenish your meter by eating the food you come across, namely donuts and weird soda beverages. Then another problem arises, as when you eat too much you’ll have to go to the toilet, or at least avoid eating and drinking for a while. If you ignore that gnawing feeling of having to take a dump, your pants might be in for a stinky surprise, which again results in the game over screen. The levels themselves are fairly short, but they prove to be a real challenge, especially with the hunger meter slowly ticking away. 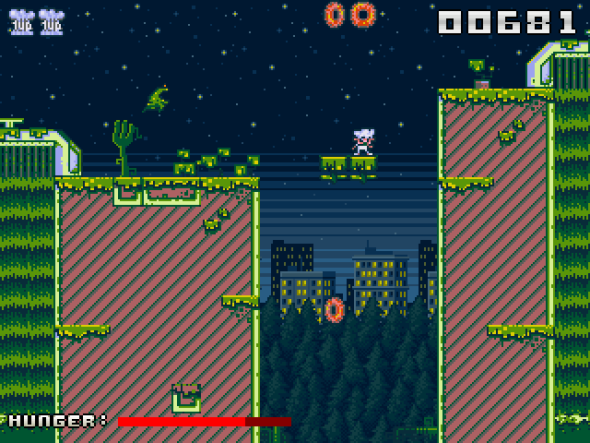 While most enemies will not kill you in one blow, falling in a pit, or getting hit by spikes mean an instant death. The latter however has a real annoying and poor hit detection, often skewering you when you didn’t really hit the contraption. The spikes are probably the biggest frustration when looking at Hermes, as the hunger meter, or the fact you have to take a dump every so often are somewhat justifiable. To ease the difficulty level a bit, you’ll luckily have checkpoints in all of the levels, making it a bit more manageable. Nonetheless, when you run out of lives, you’ll have to redo the entire level. Luckily the game also has the option to continue from the point you were last at (the beginning of said level), which means you don’t have to finish the game in one sitting. 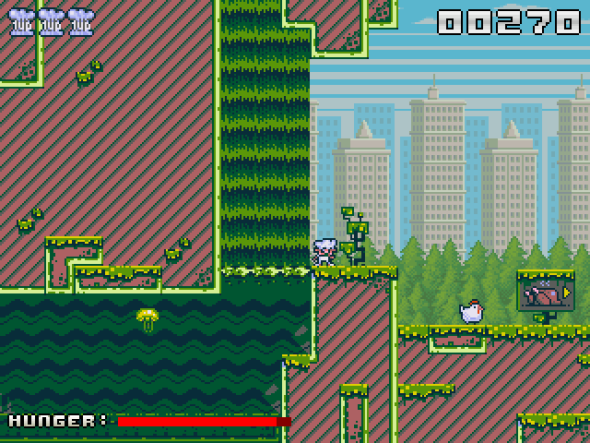 The latter is quite fun, as you can easily play this game in-between other titles this way. Hermes is all in all a very likeable, yet difficult, platformer that has a quirky and original theme. While the game doesn’t really stress the capabilities of the Dreamcast, it’s a nice addition to the Dreamcast’s library of homebrew games, and it certainly deserves to be noticed. If you’re fond of a platformers with a twist, a fair amount of humor and of course a fairly high difficulty curve, then Hermes might just fill your belly for some time.